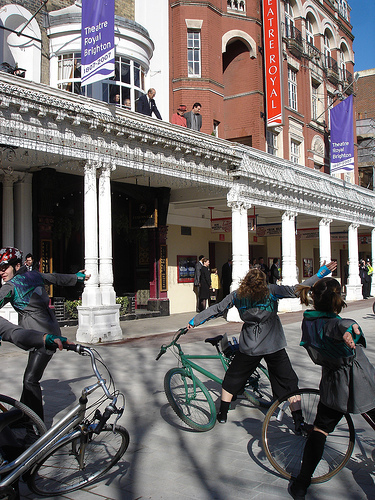 A special 10 minute performance commissioned by Brighton & Hove City Council for the Queen’s visit and the 200th anniversary of Theatre Royal, Brighton. ‘One of the best street shows I’ve seen,’ Donna Close, Arts Development Manager, Brighton & Hove City Council. Performers: Sarah Alexander, Emma Capon, Janine Fletcher, Max Glaskin, Tim Holmes, Alf Leflohic, Maria Marzaioli, Vicky McManus, Ruth Morris, Annemarie O’Sullivan, Nick Sayers, Ulrike Schilling, Carmen Slijpen, Helen Thoms, Melita Wellstead, Anna Weatherston, Karen White.